By 311, Galerius could no longer stomach the attack on the church. Along with Constantine and Licinius he issued the Edict of Toleration, ending the Great Persecution. In A.D. 312, Constantine the Great marched on Rome and took part of the empire from the co-emperor Maxentius. That left himself and Licinius as co-emperors, Galerius having died of a terrible disease in 311. Was Constantine Ever a Christian? It depends on your definition of Christian. Constantine was still emperor in a time when Christians could not make war nor be Caesar (Tertullian, Apology 21; Canon 12 of the Council of Nicea). He was not baptized, and he was still officially the high priest of Roman paganism. On the other hand, he had already urged his entire populace, by letter, to become Christians, saying, "Only let men of sound judgment be assured of this, that those only can live a life of holiness and purity, who you [in context, the God of the Christians] call to a reliance on your holy laws" (Life of Constantine II:56). He also was already addressing the bishops as his brothers. Constantine and Licinius added their Edict of Milan in A.D. 313. It went further than Galerius' edict, not only ending persecution, but restoring privileges and property to Christian leaders. This was sweet victory for the Christians. They welcomed Constantine the Great with open arms. He bestowed favors on them, and he surrounded himself with bishops. In every way, they received him as a Christian. But he wasn't one, and they shouldn't have. Constantine the Great eventually took the rule of Rome from both Galerius and Licinius, finally defeating Licinius in a civil war in A.D. 324. The following summer he presided over the Council of Nicea. Constantine didn't fool the church by calling himself a Christian. He didn't try to. He remained high priest over the pagan religion. He was a great emperor from a worldly standpoint. He did not want conflict between the Christian and pagan religions to divide his empire. However, Christianity was clearly his favorite religion, and he was highly involved in the dispute over the Trinity that hit its height at the Council of Nicea. He participated in those disputes and appointed and removed bishops, occasionally expelling ones he considered heretical from the empire. As I said, the Church embraced his intervention and even praised him as an angel sent from God for their protection. Through Diocletian and during the Great Persecution, Satan learned what works against the church. I have always said that the effect of this influx of unconverted pagans who were simply joining a national religion can be best seen in the compared histories of Eusebius and Socrates Scholasticus. Eusebius wrote his Ecclesiastical History in A.D. 323, while the Church still basically possessed the Christianity of the apostles. Socrates Scholasticus wrote his around A.D. 440 and covered the time after Eusebius' history. The differences are simply astounding. Eusebius writes about godly church leaders, doctrinal controversies, and martyrs. Socrates writes about bloodshed, violence, political intrigue, and envy. 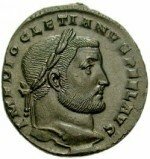 Diocletian (and afterwards Galerius), with the Great Persecution, pushed on the Church, Constantine did the pull, turn, and throw. The Church crashed to the ground. It has never fully recovered. No history like Eusebius' can be written again. The Anabaptists of the early 16th century, the Moravians and Waldensians of the 14th century, and many others have a similar history. All, however, had much less influence than the apostles' churches of the 2nd and 3rd centuries. Around such glorious lights is massive darkness. The darkness was so great that the cooperative rule of Rome and Church beginning (for the most part) after the end of the Diocletian persecution is known as the Dark Ages. How bad is it when even the world calls the influence of the Church darkness? How about the horror stories that resulted from the fall of the church during the Diocletian persecution. Diocletian's force was completely ineffective against the Church and the power of a message that was lived out. But where force is ineffective, often Judo can be very effective. It was not the force of Diocletian or the Great Persecution that was effective against the Church. It was the embrace of the world that made it fall. May we shake ourselves from its arms, rise up, and seed the world again with the purity that the apostles left in their churches. "Earnestly contend for the faith once for all delivered to the saints."